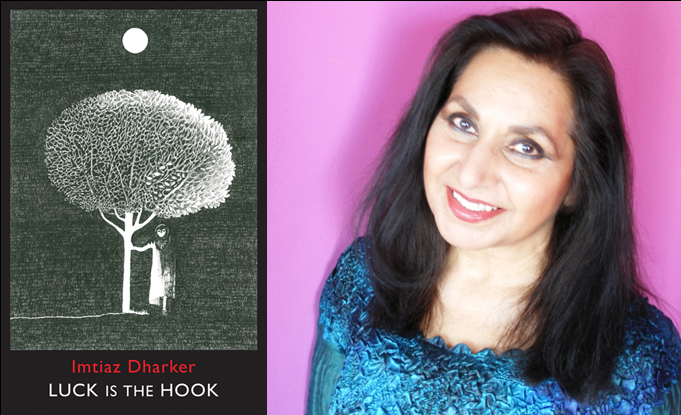 Imtiaz Dharker was awarded the Queen's Gold Medal for Poetry for her fifth collection Over the Moon. Her sixth, Luck is the Hook, was published by Bloodaxe on 29 March 2018. The book was given a pre-publication launch at Verve Poetry Festival in Birmingham on 15 February and was formally launched at St Paul's Cathedral in London on 13 April. She was poet-in-residence at the London Book Fair in April, and read at a number of festivals in 2018, including Cúirt International Festival of Literature (as a headline poet), Newcastle Poetry Festival, Edinburgh International Book Festival, Durham Book Festival (Schools event) and Ilkley Literature Festival, at which she was Poet-in-Residence. She was 'In Conversation' at the Hong Kong International Literary Festival and read at the Woodstock Poetry Festival in November. Imtiaz Dahrker was a headline poet at StAnza, Scotland's International Poetry Festival, in March 2019. Imtiaz Dharker was The London Book Fair's first ever 'Poet of the Fair' in April 2018). A five-minute interview Imtiaz gave to The London Book Fair can be read here. She was also Poet in Residence at Ilkley Literature Festival in October 2018. Links to interviews and radio features with Imtiaz Dharker are here. The last event of Carol Ann Duffy's Laureateship. Readings by Carol Ann Duffy, Imtiaz Dharker, Daljit Nagra, Andrew McMillan, Sean Borodale, Hannah Sullivan, Zaffar Kunial, Ella Duffy, Mark Pajak, Matthew Hollis and Yvonne Reddick. Poetry Evening with special guest Imtiaz Dharker, hosted by Chiswick poets Anne-Marie Fyfe & Cahal Dallat. Keynote reading Mother Tongue Other Tongue Awards ceremony.